Same great features as the epac® - but with Wheels ! The ePac® Roller has an internal telescopic handle system with inline skate wheels for smooth and easy rolling for the times you want to take the load off your back. 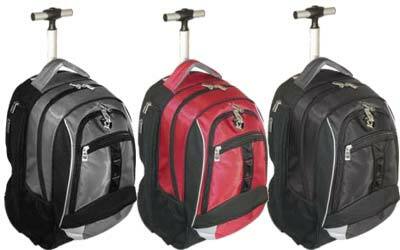 The ingenious design of the ePac® Roller converts from rolling Backpack into regular Backpack with just one zipper. Its patent-pending side-loading laptop compartment is fully padded with 4 walls of foam and a super thick 2" foam floor to further protect your laptop incase of a vertical drop. It comes with a 3 digit combination lock for the times when extra security is necessary. When worn on the back, luxurious comfort is provided by the combination of S-shaped shoulder straps with special Jelly-Centers. The ePac® Roller comes with an extra " Accessory Pocket ", a double zipper compartment designed for your adapters and cables. Additional Features: Made from 1680D Ballistic Nylon / 600D Polyester combination Inline Skate wheels with Internal Telescopic Handle system. Special Jelly-Centre shoulder straps to help cushion the weight on your shoulders. S-Shaped shoulder straps for a better fit around your shoulders. Comes with a bonus 'Techno-Pod', a separate bag to house your iPod, mp3, or digital camera while on the go. Built-in organizer panel with cellphone, pen, paper, and accessory pockets. Burnt Orange lining so you can easily find your things inside. Additional colors: Pink, Light Blue, Green and Navy.